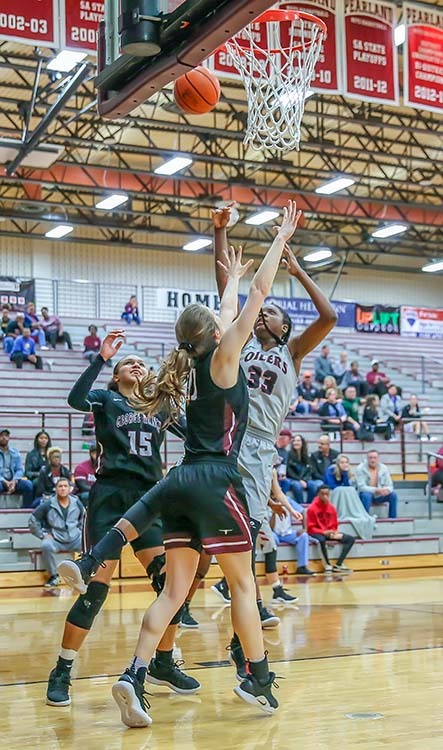 INSIDE THE PAINT - Pearland junior post DeYona Gaston (33) controlled the offense under the goal and scored a team-high 18 points to lead the Lady O's to a 55-44 league win over George Ranch. PEARLAND — Junior post DeYona Gaston scored 18 points and senior guard Macey Braswell pumped in 17 points to lead the Lady Oilers to a 55-44 district win over George Ranch 55-44 to improve to 7-1 in district. While Gaston was dominating inside the basket, Braswell was hitting from long-range on offense. Both teams were close in the opening quarter as the Lady O's nipped the Lady 'Horns 13-12 at the end of the first quarter with Braswell firing in two 3-pointer while freshman Ashlynn Patrick hit two treys and a free throw for all of Pearland's points. Gaston took control of the second quarter as she scored five baskets for 10 points while Braswell added another trey to lead the Lady Oilers to a 16-10 quarter and a 29-22 halftime lead. 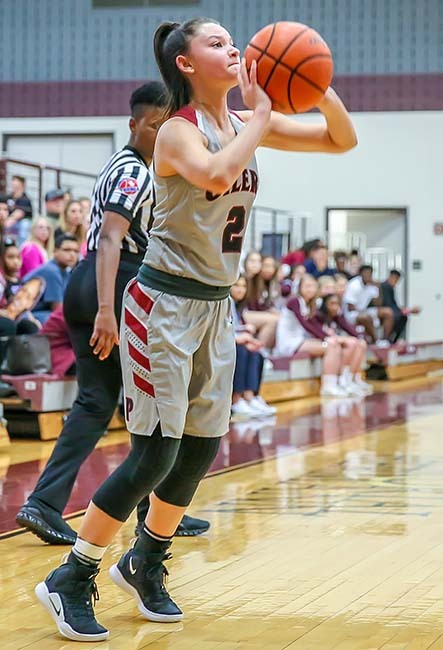 LONG RANGE MISSILE - Pearland senior guard Macey Braswell fired in four long-range 3-pointers to help the Lady Oilers to a 55-44 district win over George Ranch. Pearland outscored George Ranch 13-10 in the third as Gaston and Nyla Brown both scored four points and Braswell hit her fourth trey for a 42-32 lead headed into the final frame. The Lady Oilers finished off the Lady Longhorns in the final period 13-12 as Gaston scored a basket and a pair of free throws while Braswell hit a pair of short jumpers and a free throw to post the 55-44 final score. Pearland was 11-of-18 from the charity stripe while hitting six 3-pointers. The Lady Oilers will travel to face cross-town cousin Dawson on Friday, January 25 at 7:00 p.m. in a district clash.